This is an intense picture. Please tell us a little of the backstory. This event took place in Nabatiyeh, a small city in southern Lebanon. It is predominantly a Shi'a area (one sect of Islam, the other is Sunni) and well known for the festival of Ashura. 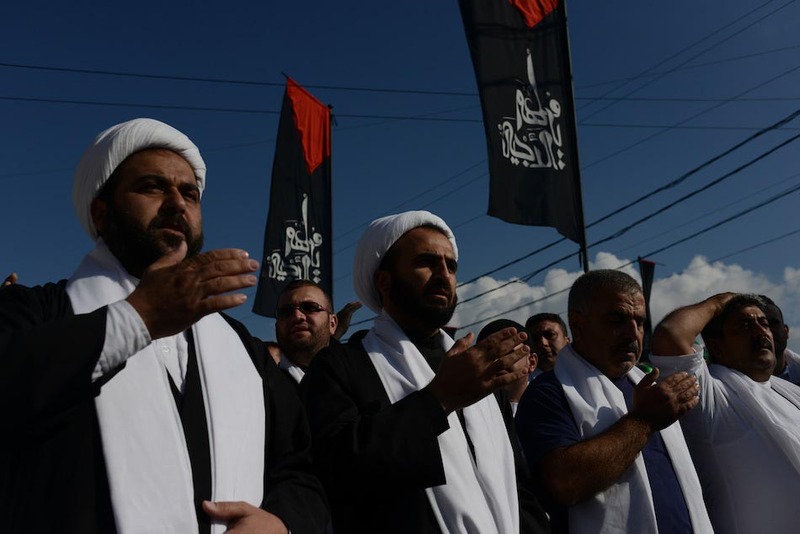 One way Shias differ from Sunnis is their reverence for Hussein, one of the early imams of Islam. 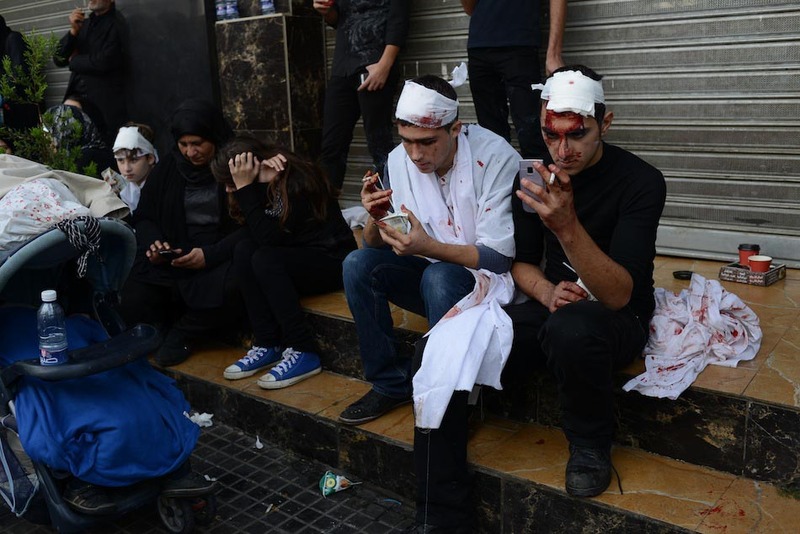 Ashura is a time of mourning and remembrance, held on the 10th day of the month of Muharram of the Islamic calendar. Hussein Ibn Ali, grandson of Muhammad was martyred during the battle of Karbala in 61 AD - the purpose of Ashura is a physical manifestation of the internal mourning for Hussein. Practitioners spend the day (and sometimes the day before) fasting and praying, many dressing completely in black till the ceremony begins. 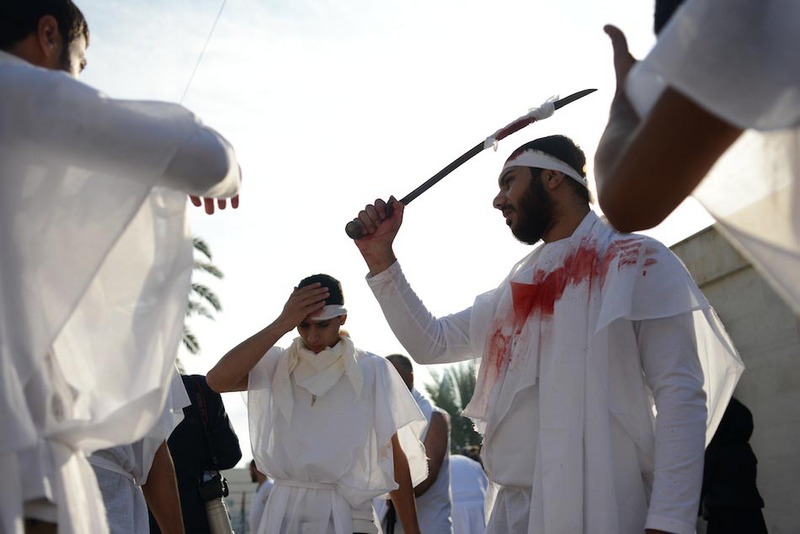 Ashura is practiced differently in Shi'a communities around the world, but nearly all include some kind of self flagellation or injury -- Nabatiyeh is known as the most brutal of these. 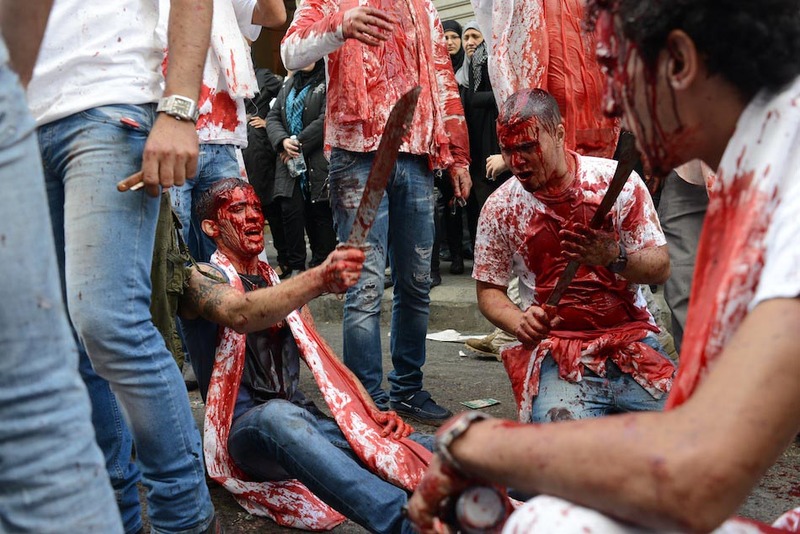 Thousands of men (and some women) young and old, march through the streets, cut themselves with razors, and beat themselves bloody crying for Hussein. 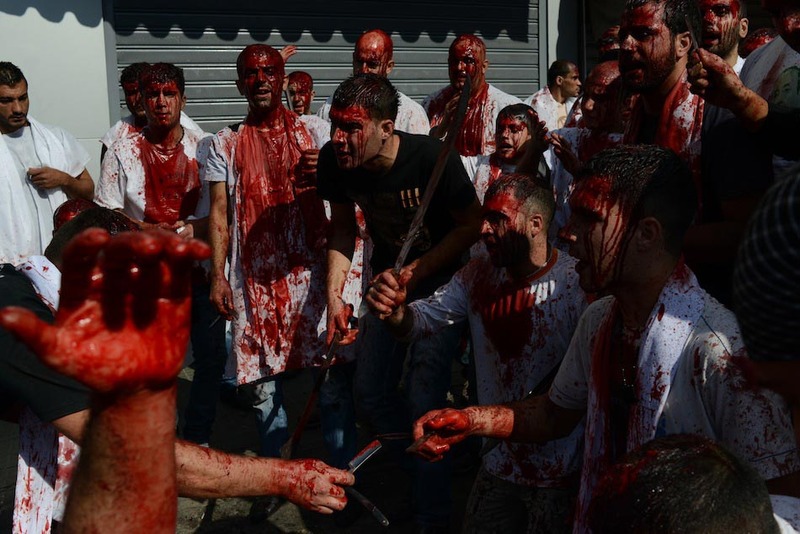 I didn't want to show the day as something completely foreign and crazy -- there are other things associated with Ashura. There's a play depicting history, people sell food in the streets -- at some points it seems like a carnival. So I read a lot (as I do with all assignments), talked to people, found friends of friends who lived there, etc. I also went down the day before; Nabatiyeh is about two hours from Beirut by bus, and there was a parade the day before, so I figured that would be good to go to and make contacts, gauge the situation. 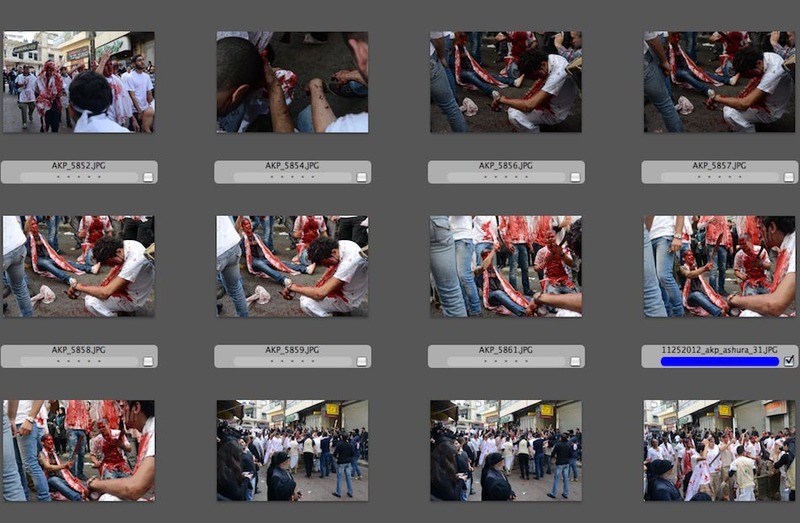 From what I am told, photographing in southern Lebanon is usually pretty sensitive, but this day, there were a few other photographers, so that was not a problem. One problem was that police uncovered a bomb plot to take place on Ashura, so some people were a bit guarded. But like in all situations I've been in in the Middle East, being a woman is advantageous -- I believe people are kinder. The biggest challenge was the crush of people; the men were running through the streets. They would stop and chant for less than a minute so I'd have to work my way in the group, try and line something up, and get out of there. If I didn't, I'd have fallen in the streets, which, by this time, were quite literally running with blood. I speak Arabic, and specifically the Lebanese dialect, so I think people appreciate that. People are more trusting, especially when I add that I'm a student, interested in learning what Ashura is actually about, etc. Regarding getting actual shots: I'm small and quick, so it's easy for me to kind of push my way into a crowd -- be it protests or a march. If I saw someone who didn't look quite friendly or out of it due to shock/loss of blood, I'd back off. I was really tired at this point. The march had been going on for a couple hours, and the people had been circling the city square that entire time. At some points I stopped and photographed the play that was going on at the center of town. Leading up to this picture I was thinking, ok, I'll take one more round and then be done, because I was hot, tired, and trying to avoid flying blood. We were coming down the hill, almost back to the Husseinia (religious community center) when the men just started falling down, hitting their heads with swords, their tears mixing with the blood on their face. I didn't have too many shots from down low, so I just crouched down and shot. The smell of blood was really strong. I never knew before what people meant when they said ''smell of blood'' and how you really can taste it in the air. It was pretty morbid. It was also suprising to me the emotion -- how truly sorrowful some people were for Hussein. Some are just in it because they are young men looking for a rush, but some are truly sad. I'm learning more about the Shi'a history and mindset living here in Lebanon and it is truly fascinating to me. Unlike Sunnis, they incorporate lots of art, music, and physically intense devotions into their faith. It's very hard to make a unique image during a protest or something like this. The viewer will be very surprised by the amount of blood, but I'm constantly challenging myself to include all aspects of the scene. Yes, the blood is signifiant, but I need to take into account everything: the reason for the blood, the emotion and history behind it. I learned how far I can push myself when I'm uncomfortable, tired, and running around everywhere. But also that I need to accept I won't know or understand everything about everyone -- ever. I thrive on gaining knowledge, it's my way to connect with others, by finding commonalities with people. Something that is reaffirmed with every assignment I shoot is that we are all truly human, despite our differences in culture and beliefs. I underestimate how much people appreciate that I can speak Arabic. I think, ''Well I live here, of course I have to speak the language.'' I think others underestimate how many doors that can open. There are people who have been here for years and don't speak a word because they spend most of their time in Beirut and use translators outside. After all of this I was looking for a bathroom and ended up eating lunch at a Sheikh's house with the women of the family in their orange garden. Be an open book, with pages written in pencil. In other words: be open to learning, adding knowledge, culture, and ideas to your life. Be willing to share yourself with others, and be prepared to change your notions of others if need be. 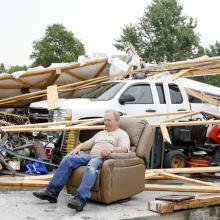 Alex Potter is an emerging photojournalist with particular interest in people and nations in transition. After growing up in rural Minnesota, Alex completed a Nursing degree at Bethel University in St Paul. Following graduation, she changed her path and turned toward a career in photography. Her nursing degree has thus far proved useful. In 2011, she completed a VII Master Class at Maine Media Workshops, followed several Occupy movements, and in February set out for the Middle East. She ended up in Yemen just before the presidential elections and stayed to document the transition. 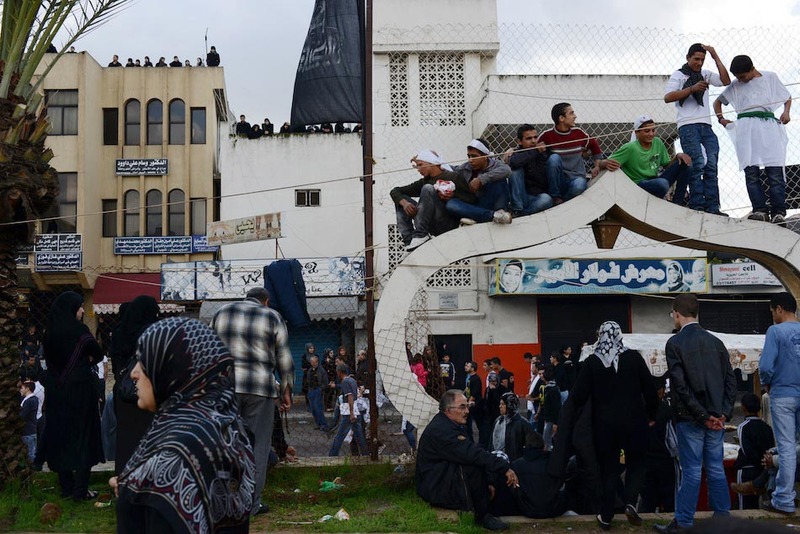 Alex is the recipient of the Chris Hondros Fellowship from Eddie Adams Workshop (2012), a Rotary Ambassadorial Scholar to Lebanon (2012-2013) and has been shortlisted by the Lucie Emerging Photographer Award (2011). She is presently in Beirut, Lebanon.